I'll try to increase the grid, I need that dimensions. Thanks, I'll let you know if your suggestion worked! As previously noted, halving the grid size takes eight times as long to calculate, so you might want to look at resizing the Fluid Domain to be as tight as you can make it on the area that you are simulating. Every little helps! Thanks for the tutorials, Phil. Great way to get an initial start. I'm happy to report that I got Fluidos installed and working without errors. I didn't have much time, so I just set up something a little ambitious right away... I mean... not compared to an experienced user, just that it'll take quite a while to calculate before I will see results. I knew I wasn't able to stay awake to mess with it, and I won't have much tweaking time tomorrow so I just wanted to test an idea that I mentioned quite some time ago - something I want to try as far as the way I'm planning to use this amazing tool. I'm guessing that, once we have the simulation calculated, we can use it in the scene as if it was just another Carrara object without the new stuff messing with the sim, right? I mean, as long as I don't parent anything to the container. I just want to try and run some elements through the simulation where my proxies are. But we could probably bring in a whole scene around the simulation without affecting it, right? Either way... I can feel myself having a lot of fun with this thing. Thanks again Alberto! Thanks again all contributors! I agree with Phil. The fragmented steam is something I observed during my experiments. Your're welcome. I'm happy you are enjoying it ! Is there a setting for linking this to the GPU, or is that automatic? Nice Manual! :) Nice, complete explanations. Bravo! My last clip was a scene exactly as described above,. just a bunch of Flud Domains (as visualisers) with the Fluid S modifier applied,. then pointed to the folders I had simuated previously,. I've been having some difficulties, but I think I found a clue in the manual. I'm starting with still water (same x,y dimensions as Fluid Domain) with an object (previously objects) already in that space very close to the floor of it. So far the entire fluid mass becomes effected by the small object. Makes it look like gravity is in reverse. I noticed in the manual that using the overall scale box under transform does not work properly for this. I didn't use that to scale my objects. I used the scale tool. But when I look, it was affected by my manual scaling. So now I'm testing by using manual values in the x, y, and z boxes in the transform. Though it may very well be that, for something like this, I need a smaller fluid grid size. Finally managed to have the right stream size without having the strem too much subdivided. I had to put the Carara scene to "Small" magnitude, bring "Overall" size of the emitter to 0,05 and the grid dimension to 400. Velocity to 23, bigger value makes it subdivide again too much, even if I would like to use at least 40. Only big issue now is the impossibility to parent the emitter and use deeper parenting. I hope it can be fixed! Yeah... there was some improvement but it still blasted the entire fluid mass to the top of the domain. That was at 0.25 grid. Going for 0.125 (default) now to see if it works. The overall scale box don't work only in the working Fluid Domain itself; scale tool is good if you use for x, y or z dimension individually. On the other hand, the objects inside domain could be scaled as you wish. Preferably, don't scale the viewer (the object with FluidS modifier) because the simulation fluid will be deformed if you do –unless it is you intended. Hmmm... I'll try making the collision object much smaller in that case. It seems like it has a much larger force field around it than it is. For my tests today, which have been similar to before, I'm using the default sized Fluid Domain in the default position. Perhaps making the Fluid Mass object the exact same size is too big? Yes, I learned how to do. I create two domains, select both and move them together to the right position, the I select only one and resize it as I need. This way I have the 100% of chance to have all working properly. I could resize the scene only if I could have an "OBJ Sequence importer" for DAZ studio. If it existed, I could simply convert those PLY files with Spin Mesh Converter and load them directly on DAZ. Ah, forgot to add I do animations! Once the scene is in Carrara, selct the whole thing an Ctrl (or Cmd) + G to make a group, then scale the whole group uniformly. Not sure what's going on. I've tried this many simple ways - I must just be doing something wrong... missing a step... perhaps this can help someone see what I'm doing wrong. At first I thought that, since the instructions say 24 FPS, maybe it doesn't work well with 30. So I tried with 24 and my GPU readings during the simulation were much smoother, but the same issue occurs. The results are consistently like this, even when I tried starting with the Sphere starting above the mass (but within the Fluid Domain influence) and animating it to barely touch the fluid mass. One time I forgot to animate the Sphere, so it never touched the Fluid Mass, and I still got the same result. Ooops... in the above image, where it says "Boundary of Original" it was supposed to continue under it with "Fluid Mass"
For the screenshot, I set the original mass to invisible but kept it selected so we could see the yellow bounding box, which fits the cube primitive perfectly. As you can see, the first frame of the simulation the simulated mass is risen up from the floor. The final frame is just some spattering on the ceiling and vertical wall as seen in the Frame 7 image, with a few drops still hanging out around the sphere. I've noticed that sometimes you can have an object moves that in real life should push the water out of the way and yet that doesn't happen in the simulation, and from discussing that with Alberto it seems that could be a limitation of the way that the fluid sim works. He suggested applying a replusion force to the object, and while that has an effect, it again didn't produce quite the effect I was after. Dart - Are you using a Surface Force on your object? P.S. I started writing this about three hours ago, got distracted through various things and therefore didn't see all the detail that you posted in the meantime. That behaviour is very strange! It almost looks like you have reversed gravity. I'll do some tests to see if I can replicate it. That's what I thought, but it's the default -32. Maybe a graphics card issue? I should also add that I didn't change the shader color until I decided to take screenshots. I only did that to help show the sphere. Okay, there was an updated version. I think that's the one I'm using, but I'll try downloading it and installing it again. When running, I suppose it makes sense that it's not using hardly any (0% - 1%) of my GPU memory. The GPU's clock spins up to max as does the Memory clock. I did notice that, when I run the simulation for 30 FPS, the GPU's clock and memory clock sort of pulse on and off, where if I run at 24 FPS, it's a smooth state of wide open. Also, during the simulation only four of my eight CPU cores crank up. The other four work a little. In this case, you must reverse your computer (the bottom upwards), and de water will be in the right way! I've just run a near identical simulation and I don't get the same results as you. When I run with no surface force on the sphere, the water just sits there. You can see the odd artifact around where the sphere is rising (due to the relatively large grid size) but apart from that, not even a ripple. When I run it with a Surface Force on the Sphere of 0.0, the water stays at the bottom and I get a churning effect around the sphere. This is due to the water trying to get away from the sphere and immediately being replaced by the surrounding water, so you get a sort of cycling effect around the sphere. But what I don't get is the water flying up to the top! And I can't see a reason why our sims are different. Does my order of operartions look complete? Am I missing a step? I read the whole manual and watched the tutorials... but sometimes we just overlook something obvious? Like I said, I'll try a fresh install... see what happens. I'll also delete all of me Temp files. I don't think anyone is suggesting rescaling your entire scene. Just position and scale the Fluid Domain to encompass where the fluid sim will take place, but try to minimise areas where there won't be any water. So for example if you have a tap filling a glass below it, position the Fluid Domain so that encompasses the tap and the glass, but anything else outside this area is not calculated. 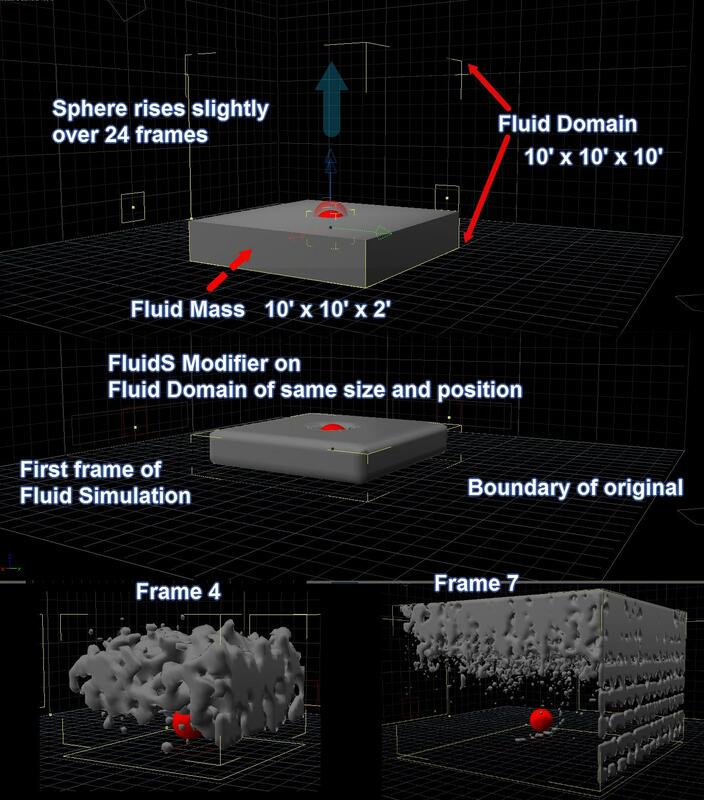 As long as the visualiser is in the same location as the origin of the Fluid Domain that was calculated, it should all be in the right position. As suggested I ran the ozone3d -viewer .Attached images show openCL results which I admit to having no real idea how to interpret . Hopefully image detail is good enough for you to see results, Image 1 is Nvidea and Image 2 is Intel. I can confirm that the plugin does not work on my computer. I ran the basic simulation in PhilW's first tutorial video and, instead of the fluid mass falling into the domain, it blows apart from within somehow. I even tried putting a -32 force on the fluid mass and it didn't pay any attention to that either. Hi Dart - have a go at loading and running this scene file. You will need to create your own folder for the fluid data but otherwise don't touch anything (you could increase the grid size to make it run faster initially).